Holds a mammoth 709ml (24oz). Das Horn isn’t actually made from the horn of a hell-beast, but the BPA free ABS plastic is easy to wash and lightweight, so you can wear your new drinking vessel using the included neck strap. Handmade Polished Horn, made from Ox Horn. Includes Horn Stand. but that will be certainly of high quality product with high class horn material. Drinking Horn Mug can be used for Water, Wine, Ale, and Beer. Genuine Quality Drinking Horn Mug from Natural Material. HOW TO LOOK AFTER YOUR DRINKING HORN VESSELS. You can use chlorine-based bleach and soak the mug for number of occasions which will help to remove the odour from your drinking horn. Large Viking Drinking Horn. Condition is New. Dispatched with Royal Mail 2nd Class. Drinking Horn Mug can be used for Water, Wine, Ale, and Beer. Genuine Quality Drinking Horn Mug from Natural Material. This is a beautiful handmade Polished Horn, made from cattle Horn. HOW TO LOOK AFTER YOUR DRINKING HORN VESSELS. These are genuine Oxen horn, no plastic imitations here. Ox Horn Shot Drinks Holder. Get the party started with this unique horn drinks holder. Great Christmas Party Gift, brilliant addition to any bar or kitchen. Viking drinking horn stand. Condition is New. Dispatched with Royal Mail 2nd Class. Handmade Polished Horn, made from Ox Horn. but that will be certainly of high quality product with high class horn material. This is a genuine buffalo horn. This is a beautiful handmade Polished Horn, made from cattle Horn. Size : Normal drinking mug. Real product will differ from given photograph in color and texture because every horn is unique in nature in color and design but that will be certainly of high quality product with high class horn material. You can use chlorine-based bleach and soak the mug for number of occasions which will help to remove the odour from your drinking horn. Handmade Polished Horn, made from Ox Horn. Never soak horn item in a tub. Genuine Quality Drinking Horn Mug from Natural Material. Drinking Horn Mug can be used for Water, Wine, Ale, and Beer. HOW TO LOOK AFTER YOUR DRINKING HORN VESSELS. You can use chlorine-based bleach and soak the mug for number of occasions which will help to remove the odour from your drinking horn. 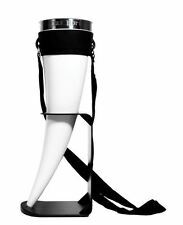 600ml Viking drinking horn with free leather holster, lined so no funny taste! Handmade Polished Horn, made from Ox Horn. If You buy one you may ask for second Mug of other design at concessional Price of 15 GBP only. ---This is a beautiful & Stylish Mug---. but that will be certainly of high quality product with high class horn material. Channel your inner Viking conqueror and make your next beer epic! Complete with neck strap, display stand and a capacity of over 700ml, Das Horn is best enjoyed by daring individuals on ambitious occasions. Handmade Polished Horn, made from Ox Horn. Includes Horn Stand. but that will be certainly of high quality product with high class horn material. If You buy one you may ask for second Mug of other design at concessional Price of 15 GBP only. Drinking Horn Leather Holster. A Holster is a must as it easily attaches your horn to your belt, so it's always within easy reach! This holster is plain black leather. (with approx. 1m of bootlace to attach securely to the horn ).